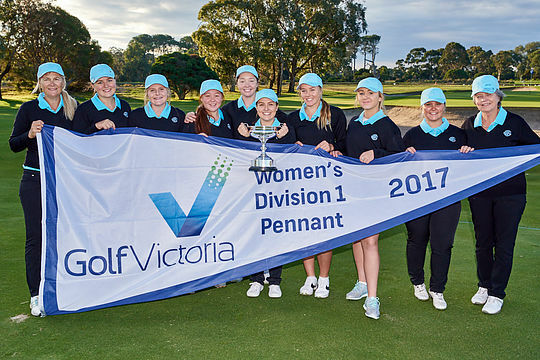 Commonwealth has defeated Victoria with a 5&2 victory to claim the 2017 Golf Victoria Division 1 Metropolitan Women’s Pennant title at Keysborough Golf Club on Sunday. As is common in pennant finals it was Commonwealth’s lower order who secured the early advantage with wins to Kim Kennedy and Kai Shipp over respective Victoria opponents Jessika Clark and Lillie Callow to set the pace for the victory. Bonnie Chigwell and Nasya Sohail squared things off for Victoria by responding with hard fought wins over Commonwealth’s No. 5, Ellen Pollock and No. 6, Sheradyn Johnson by the respective margins of 2&1 and 1-up. Commonwealth No.2 Joanna Flaherty secured a hard fought and classic battle to secure the vital match in defeating Kono Matsumoto 3&2. Flaherty began with three straight pars to her opponent’s three straight bogeys and despite an immediate fightback from the Victorian Women’s State player with birdies at the fourth and sixth, Flaherty rebuilt the three-hole margin by the ninth and was never to be headed. With Sue Laird leading Victoria No. 3 Sue Wooster by a hole playing the 18th following an impressive fight back by Wooster, who had won the last two holes in succession, it was Commonwealth No. 1 Alexandra Hilliard who sealed the victory for Commonwealth with an impressive bunker shot on the 17th for a 3&1 win over Victoria’s Gabriela Ruffels. The victory sealed Commonwealth’s unprecedented Division 1 Pennant triple crown following their win in the Colts and Men’s finals which according to Golf Victoria sources had never been achieved before in post war Major Pennant golf.